We all have spring fever, and Mother Nature aided and abetted this feeling yesterday and today with sunny skies and temps in the high 50s. I got out my trusty 1994 Yamaha Seca II, checked the tire pressure, made sure it had enough oil, and finally got it started after jump-starting from the Blazer. I wasn’t so sure about the battery (I’m still not), so I made a quick 10-mile round trip, not daring to turn the ignition off, and ended up back at my garage. I turned the ignition off, then restarted. I repeated this several times and the battery seemed to be holding. So I went out for a much longer ride, stopping for gas in Colona, and down into Montrose and then up (south) on Dave Wood Road until the road seemed a bit too muddy for my street bike. I include the GPS track below, as it has notes regarding a few interesting features. First trek of the season! into Montrose and up Dave Wood Road, then back via Pahgre. I live north of Ridgway, several miles south of Colona, so the first part of the trek was up US Highway 550. Near Chipeta State Park, I northwest onto Chipeta, then left onto West Oak Grove Road. I took this west (accounting for the switchback climbing out of the river bottom), then turned south on Dave Wood Road. Why Dave Wood Road? It’s long, straight, and mostly paved, so this was a chance to get the cobwebs out. The pavement ended but the gravel road is in excellent shape and eminently passable. I went past the Forest Service boundary where the Spring Creek Trails (see here) take off. 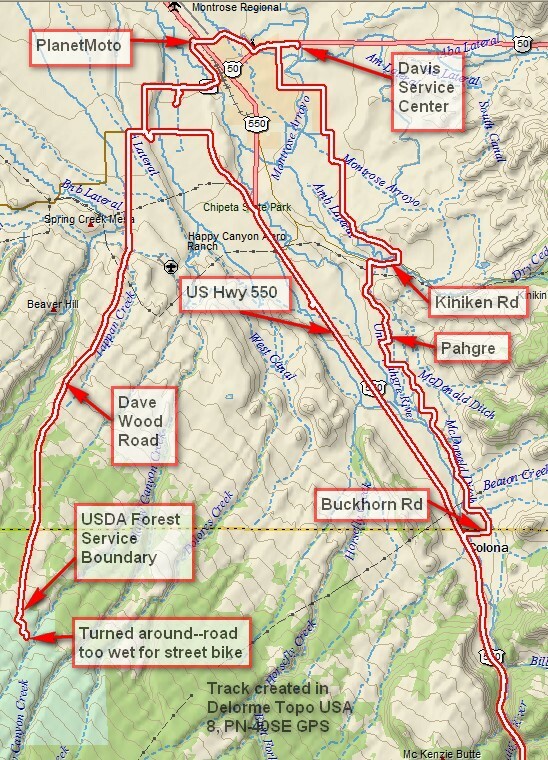 Note that the Ouray County Line (the yellow dashed line) and the Forest Service boundary are not the same thing. A sign at the boundary said that the road was closed a further 8 miles south. I didn’t go that far because the road became too muddy to attempt on a street bike. The road itself was clear, but where I turned around I’d estimate the snow was about 18 inches deep everywhere except on the road. It’ll be awhile before all that melts. Dave Wood Road climbs as it goes south. It begins in a lightly-populated, snow-free area where people have enough fenced land to have horses, then through some desert area, then finally up into trees, mostly junipers and pinion pine. Winter maintenance ends at the Forest Service boundary. The road won’t be open for end-to-end travel for a couple months yet. Back in town, I swung by PlanetMoto and the Davis Service Center, both great motorcycle shops. I bought my dirtbike from Davis Service Center in 2009. I stopped there today to look at a trailer so I can travel in some comfort to places a bit further away without having to ride there (long highway travel on the dirt bike is possible but not optimal). I came home the back way, winding around until I got to Kinikin Road, thence down Pahgre to where it becomes Buckhorn Road. Nice trip! Next time I’ll remember the camera! This entry was posted in GPS Tracks, Montrose County, Motorcycling and tagged Colorado, dave wood road, davis service center, montrose colorado, montrose county, motorcycling, planet motorsports, planetmoto, US highway 550, yamaha seca ii. Bookmark the permalink.